Elgin and Crystal Lake drivers looking for something a bit different should check out the latest Honda Civic Hatchback. The Sport trim level gets a powerful turbocharged engine, upscale features, and plenty of style. It’s the perfect small car for anybody in the Elgin area looking for efficient and fun transportation. The Civic Sport Trim features a 1.5L turbocharged four-cylinder engine and a sport exhaust system that helps it produce a generous 180 hp. The Sport trim level can be outfitted with either a six-speed manual transmission or a continuously variable transmission. In ratings by the EPA, the CVT equipped model is rated at 30 mpg city/36 mpg highway*, while the manual version is rated by the EPA at 30 mpg city/39 mpg highway*. The Honda Civic Hatchback in Sport trim level gets a few stylish upgrades, including 18-inch alloy wheels, fog lights, and underbody spoilers to give it that distinctive sporty look. It also gets all features offered in the base LX trim level, including automatic climate control, a multi-angle rearview camera, Bluetooth and USB connectivity, LED lighting, and touchscreen infotainment system. 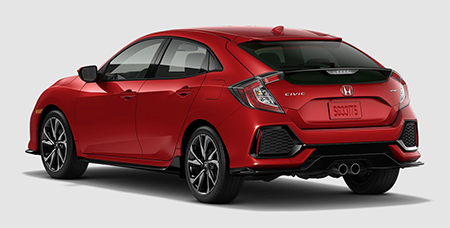 The Civic Hatchback Sport gets plenty of advanced safety technologies, including a rearview camera, adjustable head restraints, traction and stability control, and four-wheel anti-lock disc brakes. These remarkable features allow it to achieve a five-star safety rating from the National Highway Traffic Safety Association*. Drive the Honda Civic Sport or any other Civic model today here at 680 W. Terra Cotta Ave. in Crystal Lake, IL. At Brilliance Honda of Crystal Lake, we’re happy to let you test-drive the new Civic today. Visit us or contact us online now with to learn more about this trim level or any other Honda vehicle.